Hello from Vegas! Well, sort of. We got home yesterday after taking the redeye on Sunday night (ugh) and I have so much to share with you from our trip; starting with this outfit! It was quite chilly while we were there–unseasonably cold, we were informed–which is fair, I mean it is February and winter. That said, I’ve been to Vegas three times before, but always in spring – summer months so this was totally different. Let’s jump in! Okay first things first, the outfit. On our first full day of exploring, it was sunny and cool, and I definitely could have packed even warmer than this, but ducking in and out of the hotels wasn’t horrible (a warmer jacket would have be nice, but hey, live and learn). This entire outfit is new and one that I shared in my last Try-On Tuesday. When I came out of the bathroom dressed for the day, even Marco was loving this look. The pants, I cannot gush about them enough–they are 50% off, making them under $20, super comfortable, high-waisted and really easy to wear because they have a great stretch to them. I wear my waxed/coated pants all the time, have multiple pairs and these are definitely my new favourites (which is kind of annoying because I just purchased a pair of Paige–on sale, but still). As for the tee, a lot of you were asking and sadly it doesn’t seem to be online yet, however, this one is almost identical, just in black instead of the grey. If you’re local, I found mine at Bayshore. The sneakers are new and I’d be lying if I said I wasn’t super excited to pull these out for Vegas. Marco and I got matching pairs as a gift to each other for Christmas, but I haven’t had the chance to wear them yet because of all the snow. They were extremely comfy but comically we did have to purchase these to get through the entire day of walking (this was the case with my Converse when we went to New York years ago, so not out of the norm by any means–we also walked almost 40kms/25 miles over our three days). If I can offer any travel tip, it’s to bring two pairs of ‘exploring’ shoes, that way, when one gives you blisters, you have another to fall back on that likely rubs in different areas of your foot 😉 If you’re new to the brand, they run true to size, I wear a 40 and this is my first pair of the mid-stars which are a mid-high-top between the Superstar (low top) and the Slide (high top). There are a bunch of styles currently on sale here. If you’re looking for something similar without the price tag, these are super cute & I love them–they even have a red accent as well! Back to the trip, I will definitely be doing a full recap of our trip, what we did, where we stayed, what we ate and more outfits to come. Also, I know we are Tuesday but I’m going to do the weekly try-on this weekend instead–so for those of you that voted for Sundays, this weekend will be for you. Lastly, the Weekend Snaps will be coming back next week, it wasn’t purposeful that I haven’t done them, the weekends have just been kinda low key around here (minus Vegas last weekend) without much to share. That said, Monday I will definitely be back to it! I hope you had a great weekend. 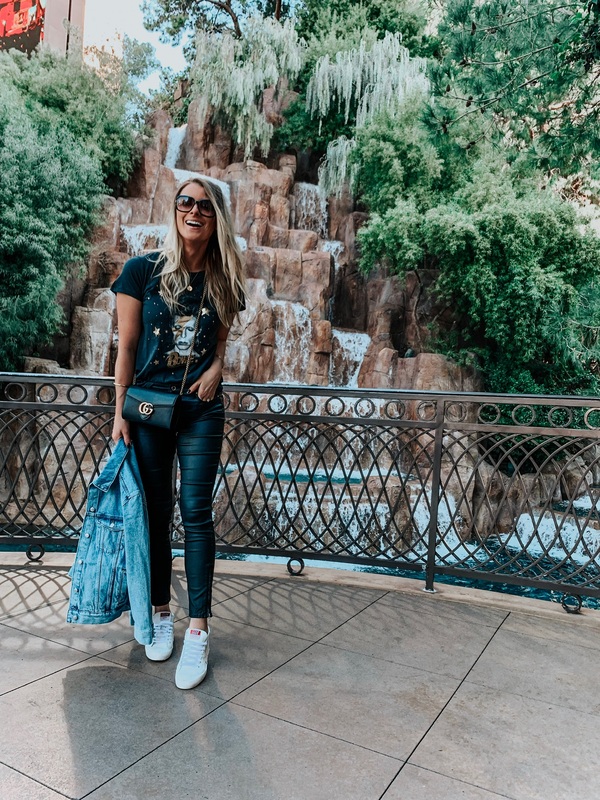 We had such a great time in Vegas, it was great to get away, kind of disconnect (what I did share I’ve saved in my IG highlights here), and indulge in things that made us happy (food, wine, shopping, relaxing, etc.). I will be back with more & hope you girls have a great day!